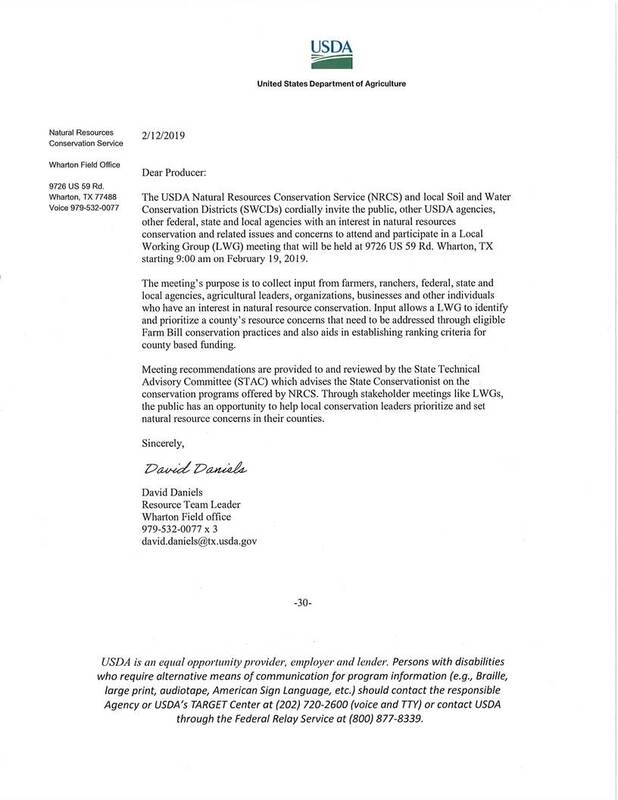 I'd like to share this notice from our local USDA office on the NRCS Local Working Group meeting to be held on February 19, 2019. 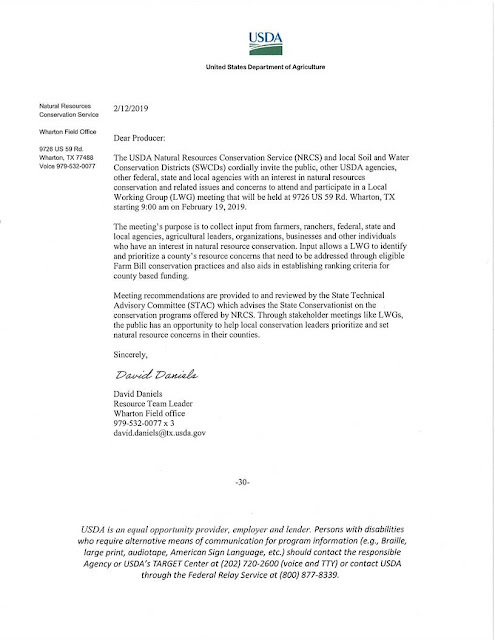 If anyone needs an additional Certified Crop Advisor CEU, read this article and take the quiz linked in the article. 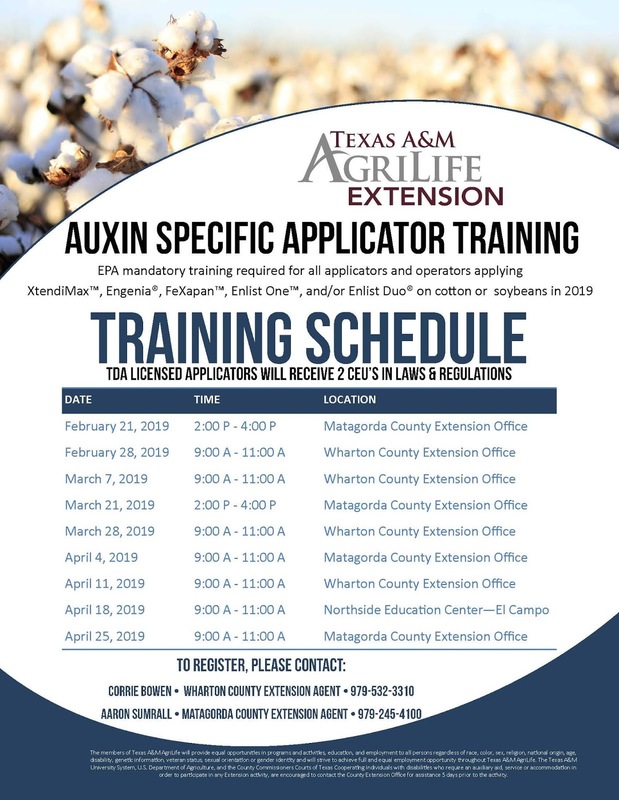 If you need auxin herbicide trainings, check out the information below. 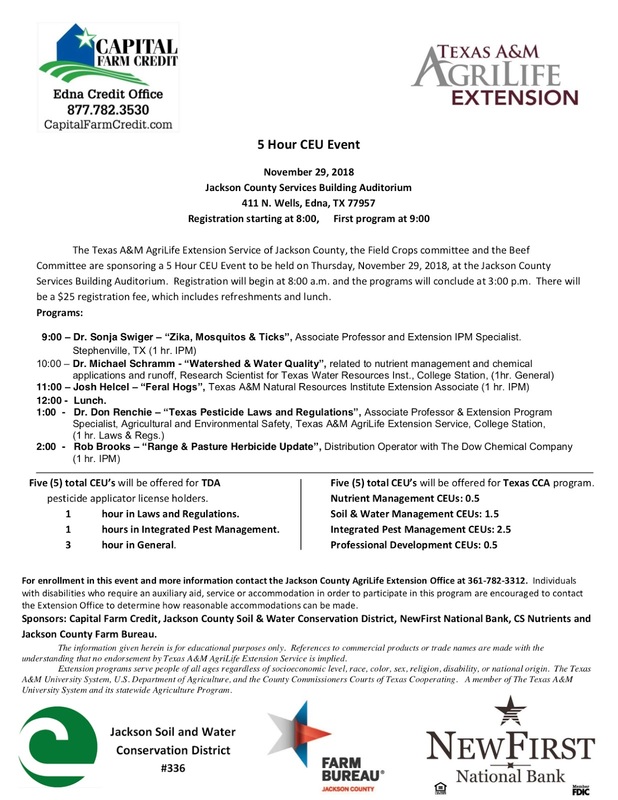 Each program will last two hours and will provide two (2) Texas Department of Agriculture laws and regulations continuing education units (CEUs) and will meet the annual Auxin training requirement for 2019. An applicator or operator must attend only one of these available trainings in 2019. 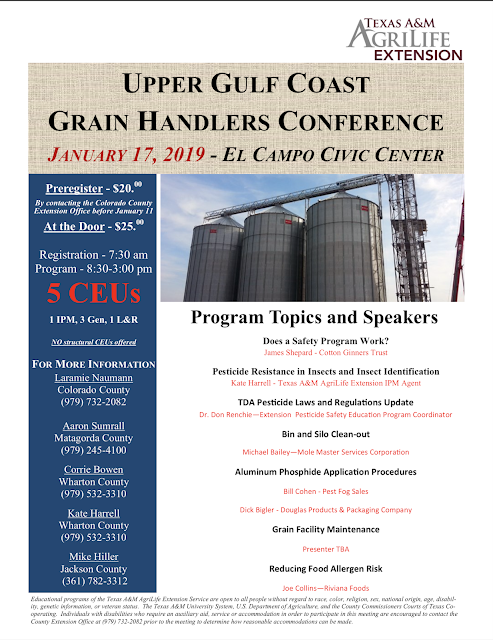 We reached 148 pesticide applicators at the Feed Grain and Cotton Conference with the required Auxin training, however, there will be more cotton and soybean producers who will need to complete this annual training. Therefore, we’re providing these nine trainings through April 25th. 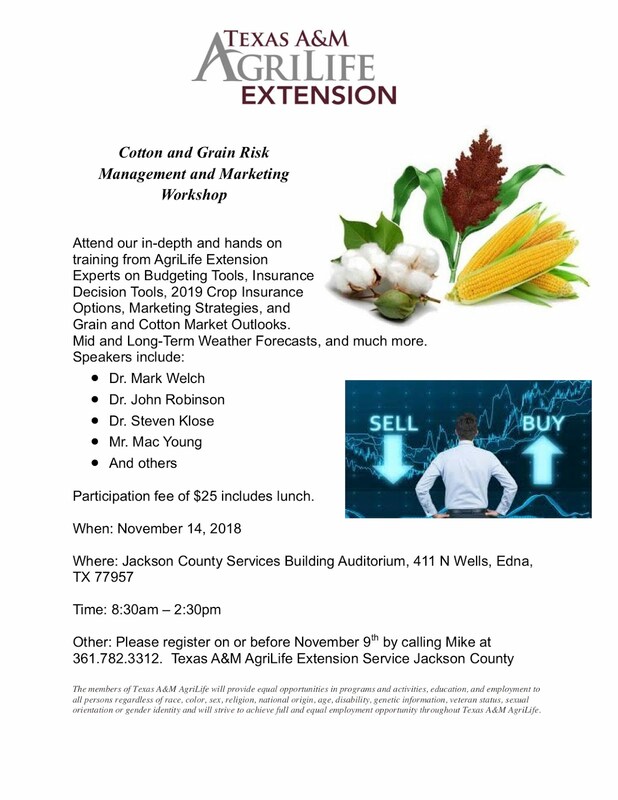 We’ll continue to provide these trainings through the growing season as needed . A flyer for this series of Auxin Trainings can be found at http://wharton.agrilife.org For any questions regarding the Auxin trainings, contact Corrie Bowen at 979-532-3310 or Aaron Sumrall at 979-245-4100. Please check out the flyers below for the details on the upcoming Western Rice Belt Production Conference and the Upper Gulf Coast Grain Handlers Conference. The cotton variety test results are available, feel free to check them out here. 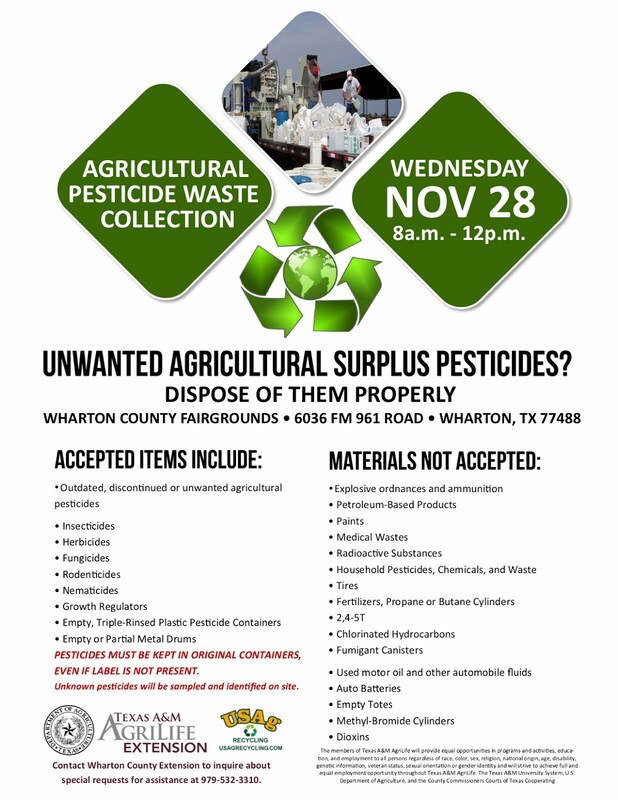 I was recently notified that TDA has decided to grant the cotton stalk destruction deadline for all of Pest Management Zone 3 until December 1, 2018. The deadline was extended due to the above average rainfall received during the last several weeks that has delayed field operations. 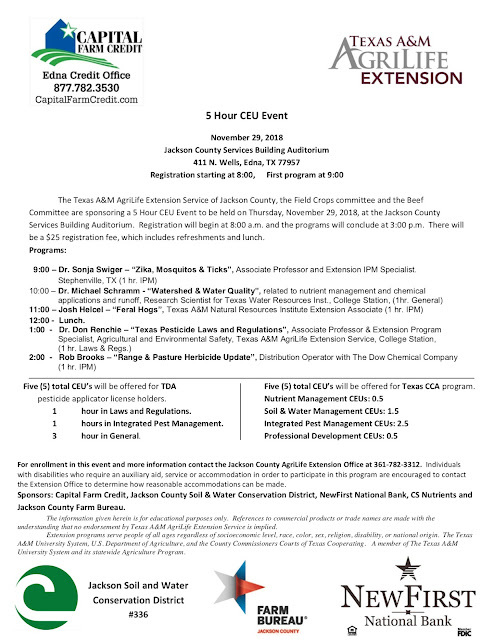 Pest Management Zone 3 consists of Austin, Brazoria, Chambers, Colorado, Fayette, Fort Bend, Galveston, Gonzales, Harris, Jackson, Jefferson, Lavaca, Liberty, Matagorda, Orange, Waller, and Wharton counties. Additionally, TDA has decided to deny the extension requests for Zone 6, Zone 8 Area 1, and Zone 8 Area 2. The recent cold spell in these zones has rendered the remaining cotton non-hostable. Section 20.22 of the Texas Administrative Code provides that the Department may grant a blanket extension of the destruction deadline covering an entire cotton stalk destruction zone or a portion of an entire zone under certain circumstances. We also have a few programs coming up, please check out the flyers for those below. We have two programs coming up soon, a Cotton and Grain Risk Management and Marketing Workshop in Jackson county, and the Agricultural Pesticide Waste Collection in Wharton county. 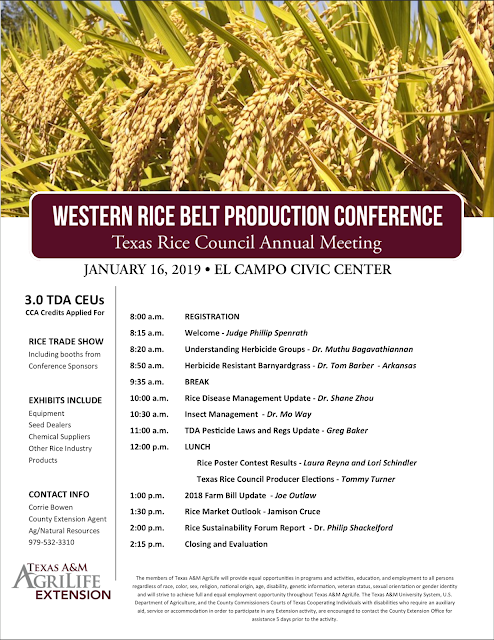 Check out our flyers below for more information on these events.